German Chancellor Angela Merkel’s ruling Christian Democratic Union (CDU) and its longtime Bavarian political partner, the Christian Social Union (CSU), are locked in a struggle over German immigration policy that could, if not resolved, lead to the fall of the Merkel government. These differences are also evident among backers of the two parties, according to a recent Pew Research Center survey. Both CDU (76%) and CSU (81%) adherents believe it is necessary for immigrants to adopt German customs and traditions, according to the survey, conducted among 1,983 German adults in late 2017. However, differences emerge when those who identify with the two conservative parties are asked about the impact of immigrants on German society. Nearly seven-in-ten CSU supporters (68%) say immigrants increase the risk of terrorist attacks in Germany, compared with 47% of CDU backers. 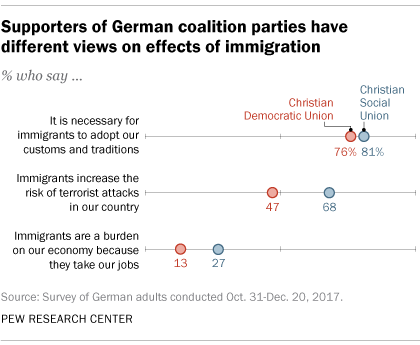 Similarly, 27% of those who identify with the CSU voice the view that immigrants are a burden on the German economy, but just 13% of CDU supporters feel the same way. 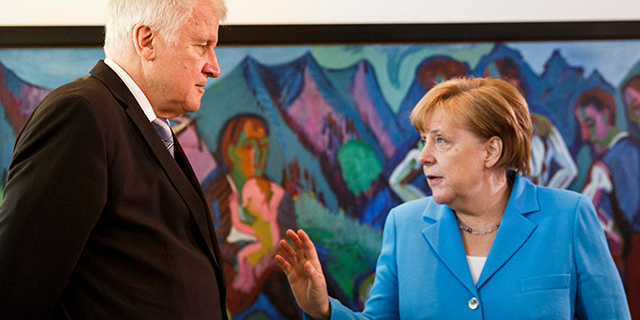 The current stalemate between the parties stems from a dispute between Merkel and Horst Seehofer, the government minister who oversees immigration, leader of the CSU and former minister president of Bavaria. Merkel wants a European Union-wide agreement on immigration policy, while Seehofer wants to turn away migrants at Germany’s border if they have registered as asylum seekers elsewhere in the EU. In 2017, more than 12 million people living in Germany were born in another country. That total was up from just under 10 million in 2010. Much of this increase was due to a surge in refugees admitted to Germany in 2015 as people fled conflicts in Syria, Afghanistan and Iraq. Germany had roughly 200,000 asylum seekers in 2017, the most in Europe. That number was down 73% from 2016. Nonetheless, the current dispute reflects a public backlash in Germany against immigrants. The CDU and CSU have called a truce to their current public squabbling, giving the Merkel government until July 1 to come up with a plan to share with other EU member states the burden of dealing with the immigrant population. One reason why this power struggle within the German conservative coalition has emerged now may be that Bavaria holds a state election in October. The CSU may fear being outflanked by the upstart, far-right Alternative for Germany party (AfD). Germans who have a favorable view of AfD are much more likely than everyone else to believe that immigrants pose a threat of terrorism, and more than four-in-ten of those who favor AfD say immigrants are a burden on the German economy, according to the recent survey by the Center. Correction: This post was updated June 22, 2018, to clarify that a policy promoted by Horst Seehofer was directed toward registered asylum seekers, not registered migrants.